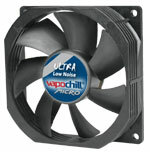 The VapoChill Micro Ultra Low Noise CPU cooler is an excellent choice for low noise environments. Solid and silent performance goes hand in hand with this CPU cooler. The VapoChill Micro CPU coolers are characterized by hermetically sealed gas/liquid chambers exploiting the most effective cooling principle available: phase change cooling. The revolutionary series of VapoChill Micro CPU coolers, capable of removing up to 150W, are based on an existing and well-known VapoChill vapor phase technology launched back in 1997. By extracting heat from the CPU, a closed sealed fluid will evaporate and reach top of the pipes this gaseous form will then be cooled by an efficient fan and radiator and turn into a solid fluid form again where as it will hit the bottom of the CPU cooler once more. 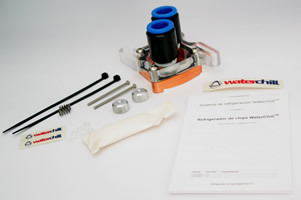 The recirculation of the coolant is based on gravity. In other words, no mechanical parts and basically unlimited reliability. The circular process in VapoChill Micro will go on and on and keep the CPU temperature cool at all time even at a low noise level. Once a commercial idea is refined, the technology developed and the final products available to the market - most innovations seem simple. 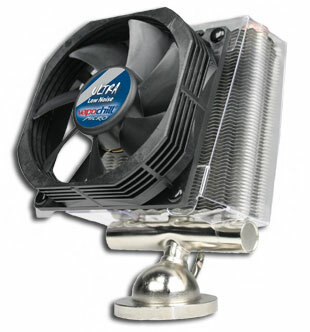 In this respect the technical profile of the patented VapoChill Micro CPU cooler series is indeed simple. Nevertheless, the vapor chamber technology of the VapoChill - utilizing an evaporation process directly on the CPU - is in all its simplicity the most cost/effective and most efficient CPU cooling solution on the market. 1. Dramatically increased evaporation and condensation surface area. 2. Direct mounting of the evaporator on the CPU. These two features, however simple they may appear, is why the VapoChill Micro is the superior solution on the market. Its not a question of opinion, it is a question of physics. No more no less. VapoChill Micro vapor chamber filled with the refrigerant gas R134a. Cooling ribs for larger cooling surface area. 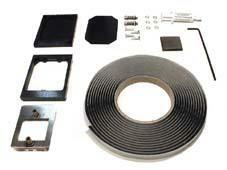 Special designed low weight and highly effective fan duct. 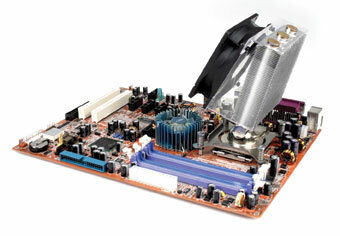 airflow towards capacitors on motherboard. Effective Ultra low noise fan. Thermal Heat Compound already applied on the base unit. Different from the heat pipe technology currently dominating the market for high-end CPU coolers, the evaporator of the VapoChill Micro is placed directly on top of the CPU. The socket mounting mechanism supports Intel S478.